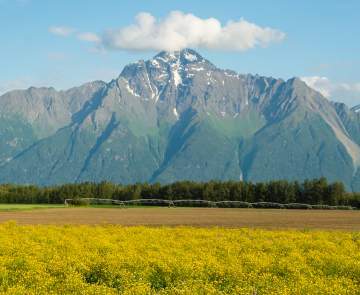 The Mat-Su Valley, Alaska is an extremely popular snowmobile vacation destination. Referred to by Alaskans as "snowmachine," these powerful sleds provide great means for exploring Alaska backcountry. Moderate winter temperatures, cozy winter lodges, incredible mountain scenery, open powder, a well-marked trail system, challenging mountain riding and some of the most unusual riding opportunities known to snowmobiling make the Matanuska-Susitna Valley Alaska&apos;s snowmobile paradise. Alaska snowmobile guides are expert riders with a passion for adventure and providing a safe, fun time exploring the backcountry. Snowmobile beneath the grandeur of Mount McKinley around Trapper Creek and Petersville along well-marked trails or open powder. 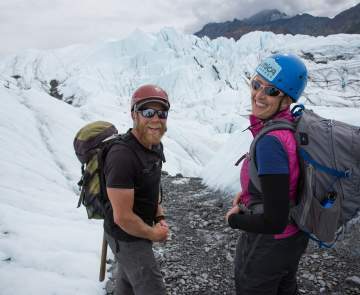 Located north of Talkeetna, this favorite Alaska snowmobile destination offers 300 miles of trail (60 of which are groomed weekly) in addition to many less-known, less-traveled routes. Main access points include the Krotto Creek Parking lot, mile 13.5 Petersville Road or Parks Highway milepost 121.5. Trapper Lake and Amber Lake Trails lie west of the Susitna River, connecting with trails west of Oilwell Road and south of Petersville Road. Two trails run north-south and two run east-west, totaling 80 miles. Access from the Parks Highway at milepost 82.5, 89 or 105. Situated between the Talkeetna Mountains and the Alaska Range, Denali State Park is split in half by the Parks Highway. Curry and Kesugi Ridge dominate the eastern half of the park, which covers 325,240 acres. Snow accumulates in October and reaches depths of six feet or more. Snowmachines are permitted throughout the park when snow depth is sufficient (about 16 inches). The West Gateway Trails near Willow connect riders to hundreds of miles of Mat-Su Valley winter trails including Corral Hill Trail (leads to the Susitna River), North Rolly Lake Trail (leads to Nancy Lake State Recreation Area), Big Swamp Trail and Old Hunter&apos;s Trail. Access points include the Willow Creek Community Center or North Crystal Lake Road. Snowmobilers will find vertical thrills and an endless variety of terrain at Hatcher Pass. Unload at the Motherlode Lodge or at a lot just below the mine and follow snowmobile routes that skirt Willow Creek and Bald Mountain Ridge to find countless trails that branch into side valleys, creek draws and onto broad ridges. Follow trails north of the pass to access Black Ridge and Willow Mountain. A 120-mile, groomed trail system begins at Big Lake with trails stretching into Houston, Skwentna and beyond. The Big Lake Chamber of Commerce sells a waterproof trail map for $5, which highlights major trails, parking areas, lodges and places to buy fuel. Thirty-eight waypoints, including several trail intersections, trailheads and common stops for snowmobilers are also marked. (907) 892-6109. The Flathorn Lake Trail begins at the Little Su Access Road. 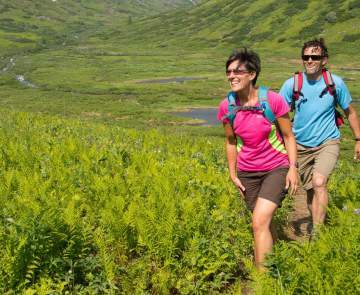 The trail crosses the Little Susitna River, extends west across swamps and crosses Flathorn Lake before heading north to Susitna Station - where it connects with the Iditarod Trail and Iron Dog Trail. This 21-mile trail is accessible from Ayshire Road, off Point MacKenzie Road. Riders can find snowmobile trails right off the Glenn Highway including Chickaloon (Mi. 67 Glenn Highway), Purinton Creek (Mile 90.1) Hicks Creek (Mi. 96.6), and Eureka Summit (Mi. 102). Parking lots at these mileposts provide a great place to unload sleds, park and later recount the day&apos;s adventures.